Oil on canvas, 23 ¾ by 17 ¾ in. This portrait of depicts Pach’s young neighbor in Arezzo, Gigi Cavigli. The art historian Laurette McCarthy attributes the monumentality of the figure and simplicity of the composition to the influence of Piero’s frescoes, and suggests that the three-quarter-length pose and undefined background are reminiscent of compositional devices the Italian employed. The portrait is also strikingly modern in its color, particularly in the shadows, and its expressive brushwork, both of which reflect Pach’s full immersion in modern French painting. While Pach’s role in organizing the Armory Show was noticed in the press, his paintings and etchings did not garner much critical attention and this specific painting does not seem to have been mentioned at all. He offered the canvas for sale for $350, the highest price of any of his works, but it did not sell. After the Armory Show, Pach’s style evolved as he began experimenting with cubism. 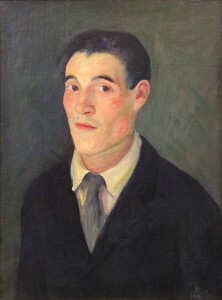 In November 1913 he wrote to the American painter Manierre Dawson, “I am working ever so differently from what I did before; much better too, there are cubist things in it.”  Pach’s shift in style demonstrates the clear impact of the Armory Show on even those who were already familiar with the new movements. They were five paintings—Flowers, Portrait of Gigi Cavigli of Arezzo, Girls Bathing, Casentino Mountains, and The Wall of the City—and five etchings—Mary, Renoir’s “Liseuse,” Gothic Virgin, St. Germain des Prés—Night, and St. Germain des Prés—Day. Renoir’s “Liseuse” was one of just two American etchings that sold at the Armory Show. Laurette E. McCarthy, “Walter Pach: Agent of Modernism,” in The Armory Show at 100: Modernism and Revolution, eds. Marilyn Satin Kushner and Kimberly Orcutt, exh. cat. (New York: New-York Historical Society, 2013), 55-65. Walter Pach to Manierre Dawson, November 24, 1913, Manierre Dawson Papers, 1904-1963, Archives of American Art, Smithsonian Institution, microfilm reel 64, frame 877.